handy. Nevertheless, I think we did a pretty good job of safely attaching a series of functional miniature gardens to the side of our apartment building. All this without dropping any boxes of dirt from six stories up (although there were a few heart-stopping, close calls). It felt great to get our hands dirty doing a little gardening, even if it did take place on the floor of our office. I grew up watching my mother garden in Wisconsin. For as long as I can remember, she loved growing things. Our house had plants in almost every room while outside there were several gardens all around the house for flowers and vegetables. My grandma’s house was the same with lots of plants and a garden out back. Both of them were public school teachers with seriously green thumbs. Growing minds and growing plants seemed to run in the family. Part of my mother’s knack for gardening may have come from the time she spent at her grandparents’ farm in Cottonwood, Minnesota. My great grandma and grandpa were farmers. They had around 50-60 sheep and grew mostly soybeans, corn, oats and hay. My mother and her siblings spent many summers there as children. I must have inherited some of this love of farming since our apartment, much like my grandma’s and mother’s living spaces, is full of things to keep alive and take care of – plants, fish and cats. And now we have these window boxes to function as our ‘gardens out back’, so to speak. Having an outdoor garden has been one of the things I’ve missed most living in New York City. Auntie Wizzie, Mom and a sheep. I remember how each spring, my mother looked forward to gardening. From college, I remember phone conversations we had during this time. She would talk at length about her big plans for that season, how her bulbs had fared over that winter, the perennials – what would bloom and when – as well as the annuals she had in mind that would really knock our socks off. She was careful to arrange her flowers so that, much like the timing of a good fireworks show, they would come up in a perpetual and constantly changing display of riotous color from early spring to late autumn. She preferred a more English-style of gardening – one that traded tidy organization for a more spontaneous milieu. If you drew a comparison between the way she grew her flowers with the way she raised my brothers and I, the commonality might be the element of plenty of unstructured free play. Mom, Wizzie and cousin Beverly playing ‘Stone Age’. My husband Nathan and I were married in August of 2010. The Christmas before, we announced our plan to tie the knot and I asked my mother to be in charge of our flowers. ready for the wedding. With the help of a few of her sisters, they grew some the most beautiful flowers to decorate our ceremony and reception. Looking back, this was one of the most meaningful gifts we received. The gift contained within itself two kinds of experiences – the first, a brief, but special aesthetic experience for everyone at the wedding, the second, a more extended personal experience for my mom. 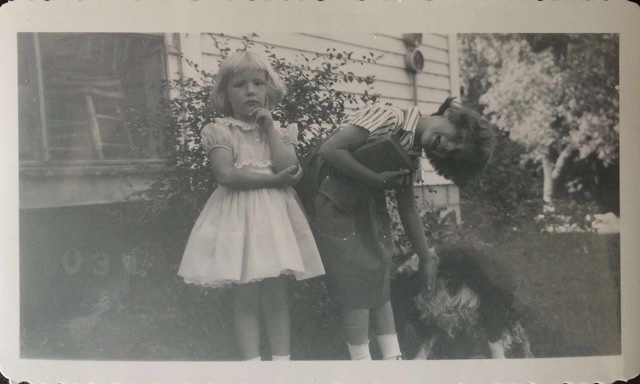 From early that spring to late into the summer, my mother had an additional motivation for gardening and staying in frequent touch with her sisters to coordinate. The timing of this was incredibly significant when the following year, in spring, she was diagnosed with late stage cancer. I moved back to Wisconsin that June to help my mother recover. She had just started chemotherapy. As I approached her house, coming down the driveway, I distinctly remember her gardens looking as beautiful as always – the perennials were in full bloom. However, there was a feeling that they had been untended for some time. The weeding hadn’t been done and they needed a bit of water. I remember walking into the living room and seeing my mother for the first time since I learned she was sick. By this time, she had already lost a lot of weight and had shaved her head in anticipation of losing her hair from the chemo. My brother Andy commented that she looked really hip and would fit right in in Madison, the most liberal city in Wisconsin. We all had a laugh. One of the things my mother has always been known for is her beauty, but never for being delicate. For the first time, I saw this fragile side of her, too. At that moment, I knew I would do anything to take care of her and keep her alive, just as she had always done for me. To support her during her treatment, one of the things my brothers and I decided should be a priority amongst us was to keep her yard and gardens looking beautiful. My mother hadn’t had the chance to plant her annuals yet, so the first opportunity I got, I went out to get the most colorful ones I could find. Shortly after that, I went with her to her final doctor’s appointment. The chemotherapy wasn’t working and it was time to consider other options. My mother opted for in-home hospice. I became her primary caretaker with the help of my husband, my brothers and my stepdad. By July, her yard and her gardens were looking especially unkempt. We were all coming to terms with the fact that we would be losing her soon. I’d often ask, “Mom, do you want me to go out and do some gardening for you?” She’d lovingly turn down my offer. My mother, well before this time, had begun the process of letting go. I, on the other hand, continued to hold on very tightly. Despite my declined offer, one hot July afternoon, I went outside to fix things. With a rake and a wheelbarrow, I spent a few hours pulling weeds, throwing down mulch, and just generally, and somewhat desperately trying to improve the appearance of her yard. At the time, I thought that my efforts were for her. Looking back, I realize they were for me. I couldn’t stand the way her gardens looked. They reminded me too plainly of who we – her flowers, her children – were losing. Life would go on without my mother, but not nearly as well. Her absence would be felt in everything she had touched and loved and cared for. Her untended yard reminded me too plainly of my imminent loss. My mother passed away just a few weeks later. She died in her living room, surrounded by her family, with the sunlight shining on her face. It was a beautiful, August afternoon. The lake was calm, her flowers still in bloom. Gardening is a little different in a New York City apartment than it is in Wisconsin – our floor has to be thoroughly vacuumed after re-potting even the smallest plant. 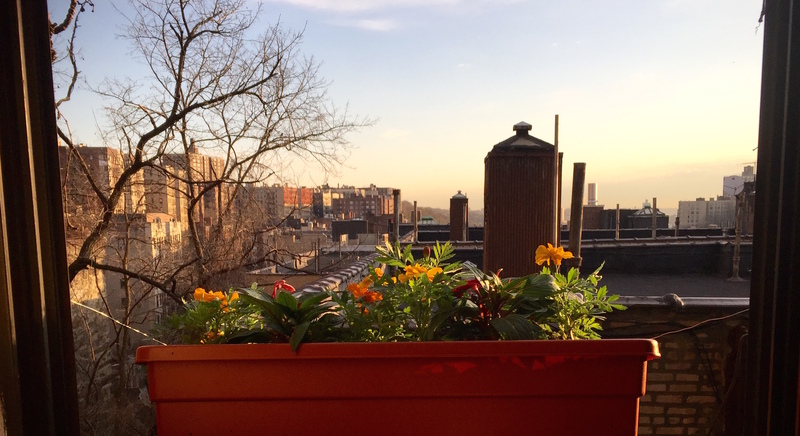 This window box project was a major undertaking for our small space. It was also totally worth it. I’m surprised at just how much I feel when I look at these little flowers thriving outside my living room window. It’s a an odd mixture of feelings that nostalgia brings – like an English garden of emotions where sorrow and joy grow spontaneously in and amongst each other. Since planting our window boxes, there have already been a few stormy nights, and yet the flowers are still there in the morning to greet me with their audaciously bright pink, yellow and orange petals. I have to say that I worry about them sometimes, perched so precariously ‘out there’ in the elements. They are so fragile, and yet somehow also woven with a resilience to withstand the wind that whips across the Hudson. They will likely be with us until the late autumn, and then, like everything else,they will be gone. By design, flowers are a perfect reminder of what life is: delicate, beautiful, resilient and temporary. In the foreground of the view out my window of Manhattan, these flowers function like a buffer of sorts, a lens that alters the way I see the city behind them. They remind me of my mother. They ground me. Behind them, the backdrop of Manhattan looks a little less intimidating, a little bit softer, a little bit smaller. It feels more like home. Hi Laurel, I’m really digging the very creative way you found to make window box that wasn’t permanent and wouldn’t require drilling a rental apartment wall or window. I’m curious, where did you get the idea? I love to replicated. Do you have any photos of side angle, can’t tell how the box looks from the side. Thanks for reading! My husband deserves all the credit for the window box creation. I will email you some pictures that I took that might convey more specifically how he did it.